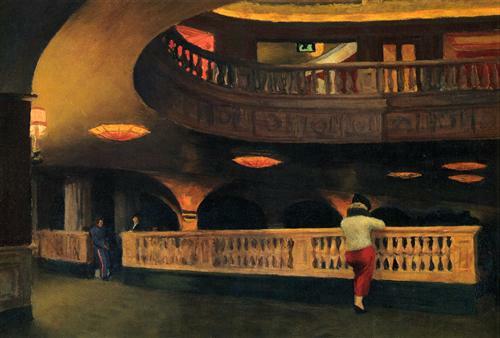 In 1920 motion picture theaters had evolved from converted halls and old stage theaters to lavish “palaces.” Max Spiegel had been in the liquor business before Prohibition forced him to find another profession. He became manager of a burlesque show and, when that proved successful, he erected the Strand Theater on Broadway at 47th Street. Before long he was building or acquiring burlesque or vaudeville theaters throughout New York and New Jersey. When he purchased the Fitzgerald Building, at 43rd Street and Broadway, he gained a legitimate theater already in the building—the George M. Cohan. 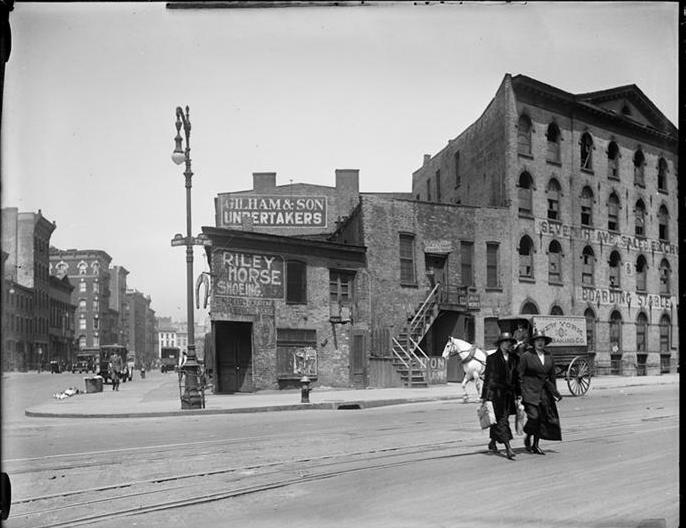 In 1914, Seventh Avenue had been extended south through Greenwich Village. The new thoroughfare cut through existing, diagonally-positioned blocks resulting in some odd triangular lots. One of these was bounded by Seventh Avenue, Greenwich Avenue and West 12th Street. 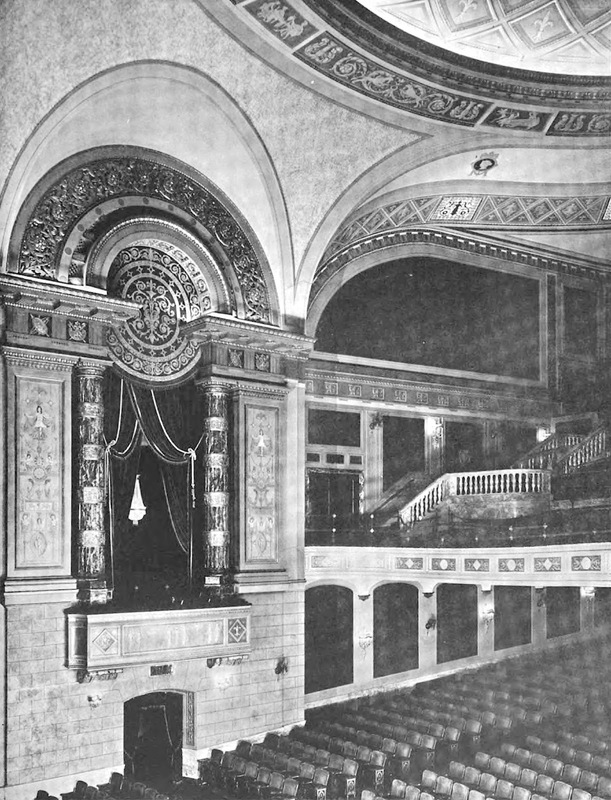 Now, in 1920, Max Spiegel laid plans for another, lavish theater for that plot. In April Spiegel’s architects, Reilly & Hall, filed plans for a two story “brick, limestone and terra cotta theatre.” The plans called for an auditorium capable of seating 2,500, and the building was projected to cost $400,000. 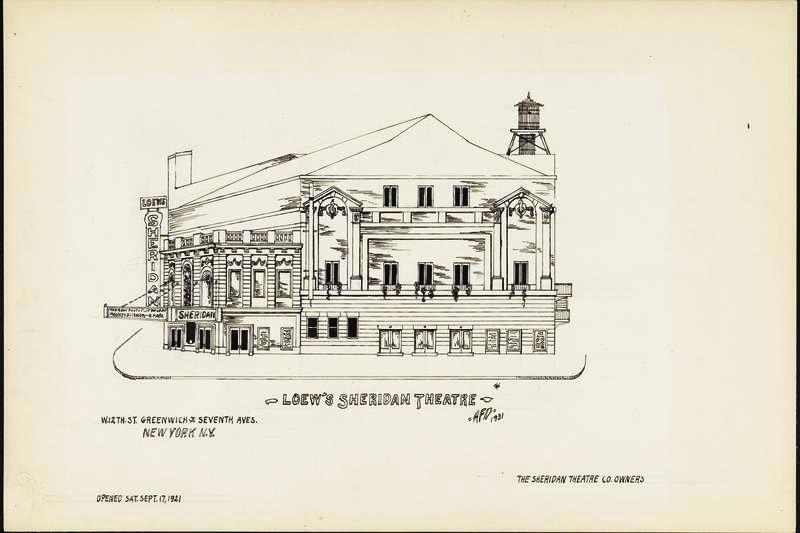 Max Spiegel told reporters that there were two important points to note about his Sheridan Theatre—“it is to be a motion-picture theatre and that it is being built without opposition from residents in the vicinity.” His would be the first motion picture theater built south of 42nd Street. The 60-foot wide dome mentioned by The Times was further detailed by Architecture and Building, which said it “is exceptionally well carried out and owes its origin to the dome in the palace Mattei di Giove in Italy. From its center was suspended a crystal chandelier which could change colors as the auditorium lighting changed. By the time the theater opened on September 19, 1921 construction costs had risen to $700,000—more than $9.25 million today. The elaborate stage equipment cost an additional $40,000 and the impressive organ—a must-have in silent movie theaters—another $9,400. Of the 2,700 seats, 1,200 were in the balcony. The New York Clipper noted “the front rows are forty feet from the screen, doing away with objectionable close-up views.” Another notable innovation was reserved seating. Silent movies required musical accompaniment. Along with the Austin pipe organ was a small orchestra, under Musical Director Walter J. Davidson. As a matter of fact, when the theater opened the musical entertainment was nearly as important as the film. Sadly for Max Spiegel, his aggressive business expansion coupled with a staggeringly-expensive Sheridan Theatre ended badly. Although his theaters were doing well, he had overspent. The stress of his financial condition caused a nervous breakdown just over a year after the Sheridan opened. 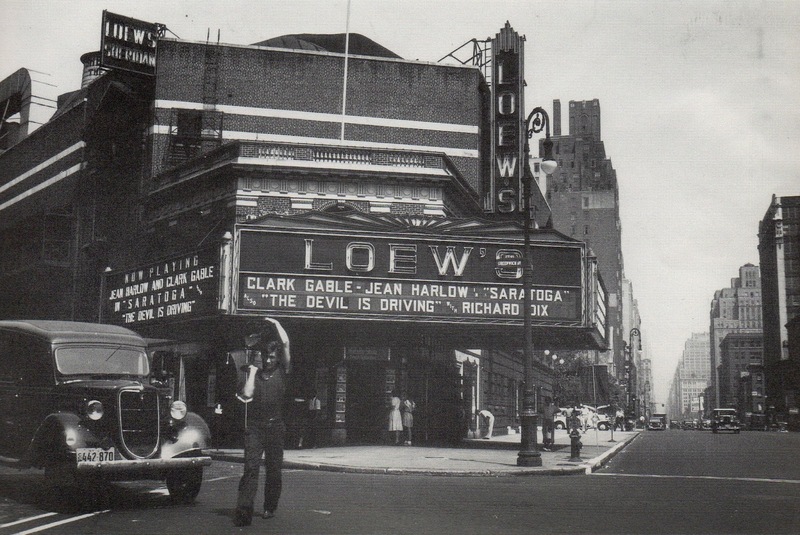 In 1926 the theater was taken over by the Loew’s chain, which renamed it the Loew’s Sheridan. The following year the first full-length motion picture with synchronized dialogue sequences was screened here—Warner Brothers’ “supreme triumph,” The Jazz Singer starring Al Jolson. The theater was the scene of much fanfare on January 4, 1930 when a bronze plaque was affixed to the façade, commemorating the site of the house where George Clemenceau lived for six months in 1870. The former Prime Minister of France led his country through the First World War and French citizens and French-Americans would gather at the spot for years, laying flowers and holding small ceremonies on Clemenceau’s birthday. The Sherdan Theatre played a major part in the sensational 1932 Lindbergh baby kidnapping and murder case. Cashier Cecelia M. Barr was first hired by the Loew’s chain in 1916 and was transferred to the Sheridan when Loew's it took over. At 9:30 on the night of Sunday, November 26, 1933 Richard Hauptmann stepped up to her window and threw a folded $5 bill at her. The film that night was Broadway Through a Keyhole, a gangster movie written by Walter Winchell. Cecelia Barr later recounted “He took the bill out of his watch pocket and threw it at me. That naturally made me look up—the way he did it.” Other factors made her take notice of Hauptmann. He was late for the screening—she was even counting her receipts, not expecting anymore patrons—and although it was a cold night, he wore no overcoat. The third reason, other than the tossing of the bill, was the way it was folded. “The bill was folded in eight parts as if it had been taken from a watch pocket. I had to unfold it myself,” she later testified. The collection of circumstances led Cecelia Barr to distinctly remember the man among the 1,500 patrons that night, and to describe him to Federal authorities. The oddly-folded bill was one of those marked by the FBI and provided as ransom in the Lindbergh case. 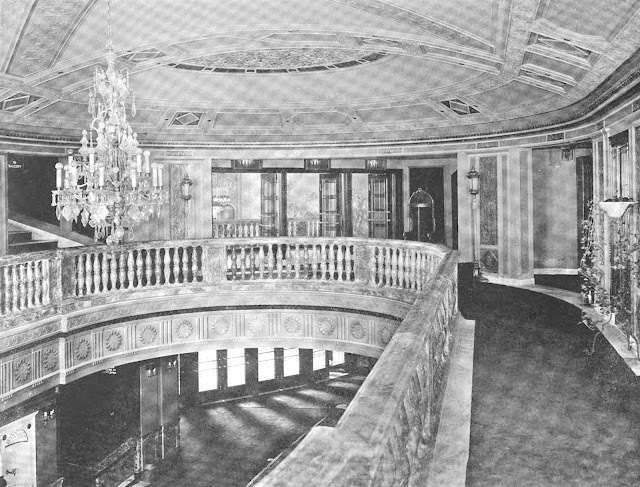 Throughout the 1950s the Loew’s Sheridan Theatre was the scene of “Christmas Motion-Picture Parties” for underprivileged children. Over 5,000 children were entertained here annually. With dwindling audiences as television began keeping motion picture audiences home in the 1950s, the Sheridan managers got creative. On June, 15, 1957 the first of the “Music for Night People” jazz concerts was initiated. That first performance was a memorable one—with Billie Holiday the headliner. 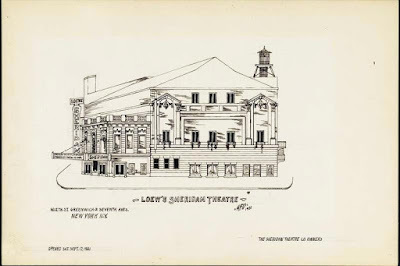 For the next few years the Loew’s Sheridan Theatre would present some of the most recognized artists in the jazz field—Dave Brubeck Quartet, and Jean Sheperd, for instance; and the premier of Alonzo Levister’s jazz opera Blues in the Subway on September 28, 1958. It was not enough to make up for the faltering ticket sales, however. In the early 1960s the balcony was closed, the first hint of trouble. Finally, in 1969, the last film was screened and the doors were closed for good. St. Vincent’s Hospital, directly across the avenue, purchased the property. Announcing the intention to construct a nurses’ residence, it demolished the movie palace. The hospital changed its mind and the triangular plot remained vacant until being planted as a neighborhood garden. Later a boxy brown facilities structure was erected in part of the plot, and most recently a public park was installed along the Seventh Avenue side. For most, the memory of the lavish silent movie palace that contributed to the ruin of a theater mogul and the capture of one of the nation’s most notorious murderers has faded away. many thanks to Simone Weissman for suggesting this post. Why was it named The Sheridan? It was in reference to the nearby Sheridan Square. 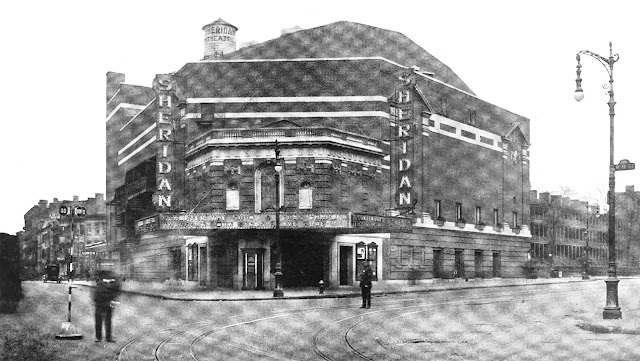 Incidentally, Spiegel built the Sheridan Square Theatre, a live theater, simultaneously. For the record, "The Jazz Singer" was not the first full-length talkie. Only the musical scenes had sound. The rest of the movie, dialogue cards were used. It did have synchronized sound for those scenes but it was primarily a silent film. Before it was demolished for the Loew’s Sheridan theater It was home to Djuna Barnes, Berenice Abbot , Kenneth Burke, & Malcolm Cowley .